Had to start somewhere and the clear repeaters for the front still aren't here, and in the absence of any exhaust/suspension and brakes mods to try I had to do something. VIR sticker on the rear windshield duly applied. Took great care, measured the center of the screen, cleaned using high quality glass products and a micro fibre cloth. Worth +5mph out of oak tree for sure. Keeping the little track icon sticker for the side window until I get to drive the 'new' VIR post repaving and allegedly widening in places, when they *finally* reopen in march. Tha's it? I thought I was going to see your car lifted up in the air with all the parts on the floor. Rollbar then seats would be nice although getting silence from european outlets as everyone is probably off over christmas and new year. Be good to have a 991 GT3 Sharkwerks exhaust bypass. Performance friction have pads for the new car but that seems to be it for the moment. You right, everybody kicking back this time of the year. Are you going to leave the PORSCHE sign in the rear alone? I have mixed feeling about the PORSCHE sign on my tail but haven't decided. It will make the GT3 stand out. And don't forget... PCA stickers! Take all of it off, then buy the black GT3 logo for the 997.2. That logo is larger, so it will look a lot better, filling the space with better proportion, and you'll be able to center it vertically. 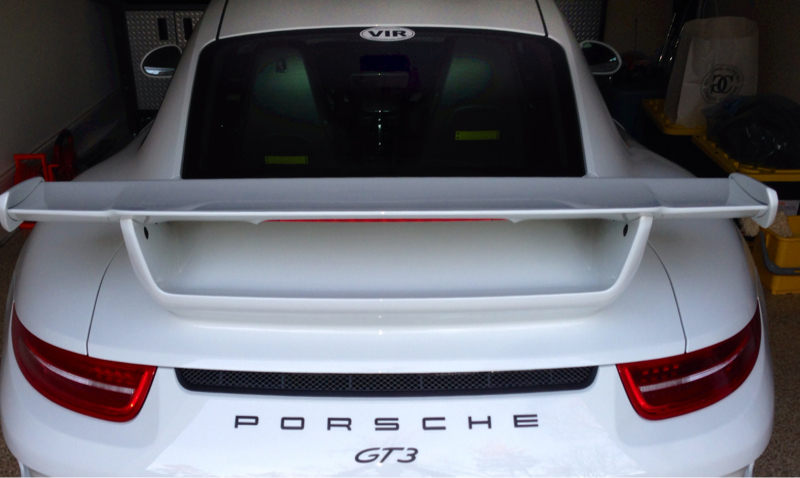 I think it would look "off" if you merely took off the "PORSCHE" and left the GT3 logo as-is. Tomorrow, thanks for the reminder And don't forget... PCA stickers! Going to leave it for a while, still getting used to it. Very cool and we ahem... Have something want me to send you one? What's available for the 991 3? Can you PM please?